You know how the old saying goes, No pain no gain! I can hear it now coming from the mouth of my high school football coach. However, is that really true? Is pain the essence of new muscle being built, or is it our body telling us to stop? You know how the old saying goes, "No pain no gain"! I can hear it now coming from the mouth of my high school football coach. However, is that really true? Is pain the essence of new muscle being built, or is it our body telling us to stop? What type of pain are we talking about? This article will address when pain can be a positive experience, and when pain can be the breaking point. We will take a look at acute pain, prevention, and delayed pain or soreness. Have you ever been lifting when you felt something pop, sting, tingle, or even crack? Most of us have all been there and later desperately wished it could have been avoided. These types of sensations felt while exercising are the keys to identifying acute pain. Acute pain is pain that occurs rapidly over a short period of time and in most cases instantly. This is the kind of pain that most athletes and lifters fear. Sudden pain felt while participating in some sort of exercise often leads to serious injury if ignored. The best response to acute pain is to stop what you are doing and figure out what just happened. If the pain is continuous, seek medical advice immediately. If the pain is alleviated by rest, then monitor the injury and make a mature decision based on your symptoms. However, anytime acute pain is felt, it is best to stop exercising. Acute pain is the negative aspect of pain that we all should try to avoid. Most injuries that occur instantaneously are due to a lack of stretching, skipping a warm-up, dehydration, stupidity, and even pride. So, how can we avoid running into acute pain? Yes, I know we have all heard this a million times but how many of us actually follow through with a strict stretching regimen? I am going to guess not so many. I have seen too many athletes limp off fields, roll of benches, and drop weights because their muscles were not actively prepared for their actions. Exercise, whether it is running, swimming, jumping, or lifting, all require the use of muscular contraction and flexion. Stretching allows the athlete to place minor stresses on the muscles, small and large, in order to prepare them for the proceeding events. In skipping stretching before and after workouts, the athlete is setting his/her self up for injury. Stretching before workouts allows the muscles to be loosened, thereby increasing range of motion. While stretching after workouts may help slow delayed onset muscle soreness (which will be discussed later). Stretching allows the athlete to place minor stresses on the muscles, small and large, in order to prepare them for the proceeding events. Often times a warm-up will include stretching but also cardiovascular activities. Warm-ups should take about 5-10min depending on the event. By jogging, riding a bicycle, or even using an elliptical, the body is allowed to get blood and nutrients flowing to muscles throughout the body. Why is this important and doesn't walking to the event obtain the same results? It is important because the body needs preparation. The heart can gradually beat rapidly, muscles can work a bit harder, and blood can flow faster. All of these phenomena play a crucial role in exercise. Walking to the event or gym area doesn't suffice because your body is already accustomed to the stresses of walking. 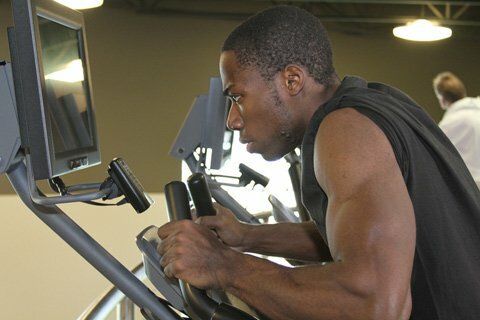 The body needs a change of pace in order to jumpstart a workout. Warming up is important because the body needs preparation. Water is the body's most abundant chemical making up nearly 80% of the human body, depending on size. Obviously water is important but how can it help reduce acute pain? By hydrating the body, every aspect of the anatomy becomes further nourished and lubricated. Muscle cells that are well hydrated can more adequately adjust to the change in motion that occurs during exercise. Also, cramps are typically a result of dehydration and can be avoided by consuming water and/or fluids containing electrolytes within a few hours leading up to exercising. adjust to the change in motion that occurs during exercise. I mentioned stupidity and pride as contributing factors in acute pain. I mention these two things because they are often overlooked when discussing the science behind pain. These characteristics often go together because typically it is pride that leads to stupidity. 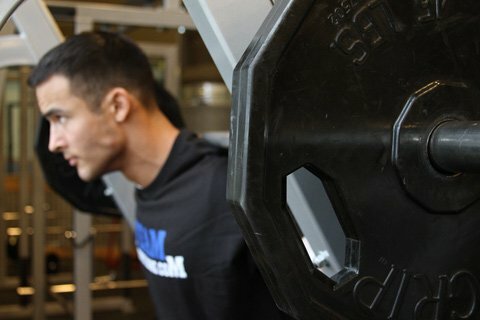 Have you ever been at the gym and seen a young kid in the squat rack that weighs 120lbs doing too much weight and using terrible technique? Pride is what led the kid to perform such a ridiculous act. Never let pride get in the way of technique. If proper form is maintained while exercising you will save yourself from much regret. When you are preparing for an event, leave your pride at the door, humble yourself, and think before you act. If you follow those three steps, you can make sure you are not the one screaming for help and injuring yourself at the gym. save yourself from much regret. Now it is time to discuss the good pain that we have all endured. Soreness is most often the result of working new muscle fibers and/or using the same muscles in different ways. Delayed Onset Muscle Soreness or DOMS is the medical term used when dealing with the pain felt 12-48 hours after exercising. The difference between acute pain and DOMS is that DOMS is usually harmless and usually a sign of growth, while acute pain is a serious threat to one's health. A physical therapist once told me this after injuring my back, "If you hurt at all in that area while performing an exercise, then you are doing something wrong. However, if you hurt at all the next day from exercising, then you have done something right". I have taken this statement to heart and used it to seek delayed soreness while avoiding acute pain. Soreness is most often the result of working new muscle fibers and/or using the same muscles in different ways. When the body becomes used to performing a certain motion, soreness usually begins to fade away. For most athletes, this is the time when a routine change is needed. Soreness is typically used then as a guide in determining when muscles are ready to be "shocked" with new exercises. The makers of the hit workout program P90X used this philosophy while forming their workout plans. They call it "muscle confusion". All that this term means is that when muscles become accustomed to a routine, they need to be "confused" again and again to promote growth. I think anyone who has tried P90X would acknowledge the fact that soreness is typically present during the 90 day regimen. Despite the desire to feel the soreness factor after a well-structured workout, there are ways to limit the magnitude of soreness, thereby increasing recovery time. The primary trick to lessening the degree of pain felt post-workout is stretching. Stretch all muscles wisely, while focusing intensely on the primary muscles that were involved in the exercise. The effectiveness of stretching has already been discussed above. For an in depth look at stretching please view the vast array of articles available online at bodybuilding.com. As far as supplementation goes, the traditional supplements like protein and glutamine are vital in speeding up the recovery process of torn down muscle fibers. Supplementing 20-40 grams of protein before and after workout, as well as upon awakening and going to bed, is a wise plan to follow. As for glutamine, try to take 5 grams post-workout and 5 grams before bed. Do not rely solely on supplementation for everything. Your body is a marvelous machine capable of recovering all on its own when the proper precautions are taken. So what does all of this mean? It means that the phrase "No pain no gain." is correct in terms of soreness but rather incorrect when dealing with acute pain. Many hard-nosed athletes and coaches preach the importance of painful workouts yet fail to watch for signs of possible injury. Yes, muscle fatigue and soreness is a good sign when attempting to improve one's fitness; however, all pain should be monitored closely to avoid setbacks. Acute pain can be avoided by maintaining a good stretching program, warming up prior to exercise, drinking plenty of fluids, and keeping your pride in check. Delayed pain should be used as a guide during an exercise regimen, and confusing your muscles occasionally can induce serious gains. Use supplements only to "supplement" your body, and do not load up on supplements just to cheat yourself in the gym. Chad Bartel enjoys everything about physical activity and a healthy lifestyle. He enjoys sports, medicine, and spending time with family/friends.